Egerton stands on a 350 ft ridge of Greensand 9 miles north-west of Ashford and has some of the most magnificent views across the Weald of Kent and Ashford valley. The 13th Century village Church of St. James’ dominates the many old cottages around it. 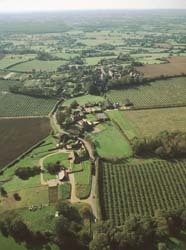 The lower part of Egerton is formed on Weald Clay. Almost every type of domestic architecture is evident in the village, from Period Hall Houses, Yeoman Houses and Kentish Barns, to modern bungalows, detached and semi-detached houses. The predominant style in Egerton remains red brick with plain tile roofing. The oldest surviving houses in the village date from about the 15th Century, but the presence of the Church with 13th Century origins clearly indicates that the settlement is older than it appears. These houses are surprisingly not all clustered in the centre of the village around the Church, but actually spread out along other roads and often some distance away. Such scattering indicates the importance of farming in the Parish, with homesteads built where the land was worked. Damp pasture would be available on the Wealden Clays south of the village and richer soils would support arable farming on the better drained soils on the Greensand Ridge. This pattern is broadly unchanged today, with orchards and crops on the high ground and largely livestock grazing on the lower fields.